Kladas and his nephew, the Menaia brothers, the Busichii brothers, and others lost their lands as a result of the peace settlement between Venice and Mehmed II: the lands were in Mani and Mehmed got Mani. Giovanni Dario and Halil Bey, along with the sancak-bey and other officials, had to negotiate the territorial boundaries between Kalamata territory and Methoni-Koroni territory. In this process, several people ended up keeping properties that might have been thought on the wrong side of the boundary. Marin Sisani and Nicoli Romagni kept theirs at Marolendi. The Ca' Gezzo people of Koroni kept Dargenin. And Jacopo Testa, a Venetian merchant from Methoni, kept the castle of Cosmina he had received from Despot Thomas (he also had a document with a silver seal confirming his father-in-law's possession under the Principality of Achaia fifty years earlier). These people had all apparently been able to give the sancak-bey and Halil Bey adequate presents. What is interesting here is that Cosmina is one of the very few fiefs that can be tracked through various owners, and we have information for Cosmina from 1354 to 1480. Cosmina was a kastro with a tower located just inland from the modern town of Chrani on the coast road, mid-way between Koroni and Kalamata. It was apparently in the position of the (now-deserted) village of Vigla ("watch tower") which is reached on a steep stony path up from Chrani. In 1354 Cosmina was one of the 15 or so fiefs held by Nicolas Acciaiuoli who served Catherine of Naples (who had inherited the title of Frankish Empress of Constantinople) and Robert of Tarentum (who had inherited the title of Prince of Achaia from the house of Anjou which had robbed it from the Villehardouins). From that period we have a list of 8 free men living in the fortress, and the names of owners of five deserted farms. Then in 1357, Cosmina was assigned to Jean Siripando of the court of Naples where he was a knight, professor of law, chancellor, councillor, and intimate friend of the royal household. He probably never went there but he received an elaborately detailed document which lists the names of the paroikoi who lived within the walls of the kastro, and their sons and male, the existence of a wife, omits daughters, and specifies what they owe the estate annually. Georgius Potamiatis habet uxorem, filium Athanasium, tenetur pro tercia parte stasie sue yperpera quatuor sterlingia novem et tornenses tres, et pro ejus servicio personali ypeper quinque. Pappa Theodorus Lurea habet uxorem, filium Georgium, tenetur solvere yperpera quatuor sterlingia duo et tornensem unum, et pro ejus servicio personali yperpera quinque. Also as mentioned earlier, some monetary equivalents are: 1 hyperper = 24 soldini/deniers/sterlings = 1/2 ducat. 1 soldo = 4 tornesi/toneselli. I do not know the value of this money, in terms of prices and what one could buy, but we do know that coinage was always very scarce in the Morea. There are 46 households in this list of paroikoi, 43 headed by men and 3 by women (2 widows, 1 daughter). Twenty-one of the households have sons -- 12 have 1 son, 5 have 2 sons, 3 have 3 sons, 1 has 4 sons, for a total of 35 sons. Daughters are not listed. Seven households have a brother or in-law in residence. In adding up the list, I find 52 men and 33 women. I have invented 35 daughters to balance off the 35 sons. With the invented daughters, I have a population in Cosmina of 155 paroikoi (although two priests are noted as free men, and therefore not liable for personal service). The 155 paroikoi come out to an average household size of 3.3, which is extremely low for the households I have been examining. I have not looked at lists for other fiefs, but the low number brings to mind multiple Venetian complaints of how few villani they have (because of raids from the Principality and from Turkish ships), and how difficult it is to get adequate food for Methoni and Koroni. There is a gap of information from 1357 until 1402 when the Venetian senate commended the owner of Cosima, a Rosomica, for the protection he had given Venetian paroikoi within his walls. The governors of Methoni and Koroni were instructed to be extremely cooperative with him. At some point, Petro SanSuperan, Prince of Achaia, assigned Cosima to Nicolò de Leonessa of Patras and Methoni. The Leonessa were a prominent Patras family originally from the Abruzzi, close to the Accaciaiuoli in the previous century as one was Archbishop of Patras and his brother was Nerio of Corinth. Nicolò knew Cyriaco of Ancona when he visited Patras in 1437. Nicolò's father, Aegidius, was a doctor to the Prince of Achaia, and a merchant with a house and business on the central plateia in Patras. The Prince gave him a fief near Patras. He was also doctor to Carlo Tocco, who gave him another fief near Patras some years later. He also had a house and in-laws in Methoni. A great many legal documents concerning Aegidius de Leonessa have survived, mostly in Greek. Carlo II Tocco gave Nicolò a fief near Patras. In 1447 Cyriaco, travelling south to Koroni, says that the fields and countryside were verdant and charming, with peaceful gardens and trees abounding in foliage, although he does not mention Cosmina or Nicolò specifically. There is another gap until 1454 when Nicolò's son-in-law Jacopo Testa received Cosmina in 1454 in an argyrobull from the Despot, Thomas Palaiologos, in appreciation for Nicolò's services. Testa was an extremely wealthy merchant doing business in Patras which was Thomas' main residence, and in Methoni. Two surviving documents from Methoni in 1479 and 1480 indicate a large interest in the wine and oil trades, making contracts through 1485. The date of 1454 is significant: after the Albanian-Greek rebellion, the despots needed to secure friends wherever they could find them, and in 1460, when Thomas finally left the country for Italy, escaping from Mehmed, he stopped by Cosmina on the way from Leondari to get a boat at Pylos/Navarino. This was probably when Testa took up permanent residence in Methoni. In 1465 Sigismundo Malatesta, commander of the "crusade" in the Morea against the Turks, camped at Cosmina for some time. His army was saturated with plague, and one can only imagine the effects of plague, too many men, and too many mouths, on a farming community. We know nothing of Testa during the Malatesta occupation, but given the similarity of the names, and the fact that Patras had been a Malatesta holding during 1424-1430, I can only wonder. Then in 1480, we have the records of the boundary negotiations, and Testa's success in holding on to his territory. You can see from his family history that he must have been able to give a very suitable gift. He seems to have died in in 1496, leaving a son, Antonio. Cosmina disappears from the records. Documents sur le régime des terres dans la principauté de Morée au XIVe siècle. J. Longnon & P. Topping. Paris, 1969. Neue quellen zurgeschichte des lateinischen erbistums Patras. E. Gerland. Leipzig, 1903. 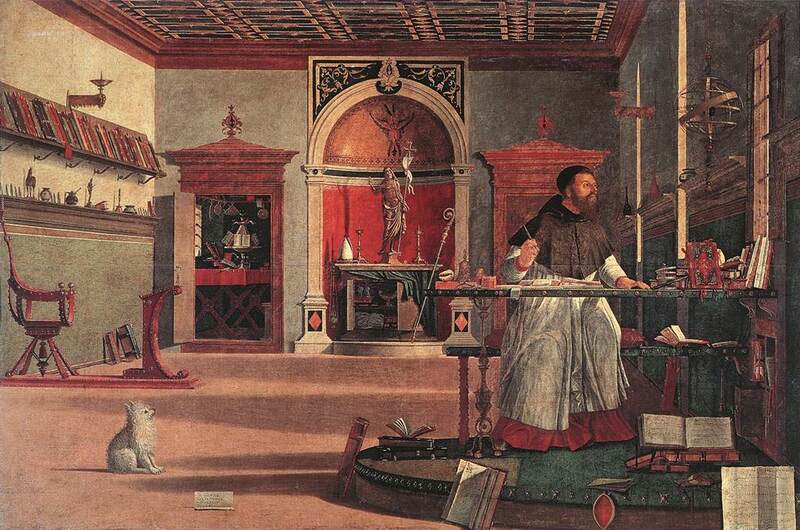 In Carpaccio's painting of St. Augustine, at the instant when he becomes aware of the death of St. Jerome, there is a small fluffy white dog. This dog, too, has become suddenly alert at the sudden stream of light from the upper right. It is a wonderful room, books piled on books, a wooden platform to keep feet from the cold floor, books along the wall, another room of treasures, his clerical effects untidily lying around the altar, a shelf of Greek antiquities to emphasize the Greek connection, and a bear-paw sconce for a light like the sconces in Cocteau's La Belle et la Bête. Although Cardinal Bessarion had been dead for thirty years (1472), Augustine and his room are based on Bessarion's life (I like to think my own study reflects Bessarion and Augustine), and Carpaccio shows, among Bessarion's collection of astronomical instruments, the astrolabe made for him in 1462 by Regiomontanus. This astrolabe still exists. He had met Regiomontanus in Vienna the year before, when he was travelling on behalf of the Papacy looking for support for a crusade in Greece against the Turks. Regiomontanus left Vienna with Bessarion and spent several years in his household, collecting and copying scientific manuscripts. As far as I know, there is no mention of a little white dog in any Bessarion material, but I have always been charmed by the dog, and so imagine my delight when I discovered another little white dog in this Ptolemy manuscript made for Bessarion's collection. 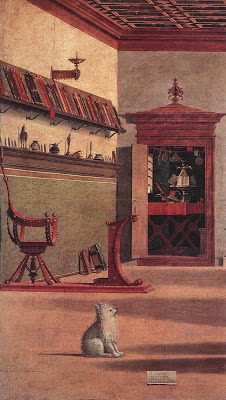 The dog seems to be perched in Bessarion's cathedra, adjacent to his studiolo with Venetian ornamentation, and with that studiolo we come back to St. Jerome who was the Renaissance prototype for the scholar in his studiolo. Portrait of Ptolemy, Geography, c. 1453. This picture should be quite large when downloaded, which you will need to do if you are to see all the wonderful details in it, including that astrolabe again. This one, too, has a stream of light from the upper right, illuminating the mind of Bessarion who is shown as a magos, a wise man who studies the stars, as did his teacher, George Gemistos Plethon. He also has all those untidy piles of books -- look at that wonderful large illustrated codex, and platforms to keep his feet from the chill. Bessarion -- or Ptolemy -- is wearing a crown, which associates him with the "wise men from the East," the Magi who became kings in Western art. Now about the dog. I read some years back that wise men, magoi, were represented with white dogs, as wise women (who of course must have been witches) were supposed to have black cats. (I should admit here that a preliminary sketch by Carpaccio shows a beardless man with a rather nasty-looking cat, instead of a dog.) This dog-cat assignment sounded quite reasonable, but it occurred to me recently that these are the only two images I have seen of wise men with white dogs. 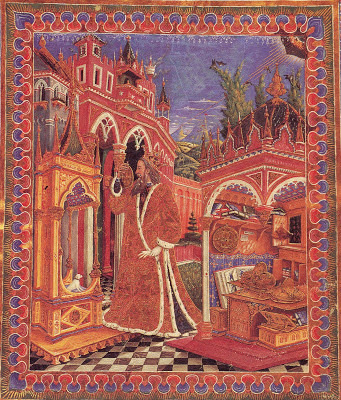 Most of the Jerome images give him a cat, possibly because of his lion. So I don't really know if magoi have dogs, and would be delighted if any readers could produce more images. Nor do I know if Bessarion actually owned a white dog, or any dog. He probably did. Bessarion was always adding people to his household who needed help in some way or another, and surely local dogs would have noticed that. So if any reader should come across a line in a 15th-century source that mentions a white dog in Bessarion's household, or any dog, I would be particularly delighted to know about it. One more comment about the manuscript painting: ranged along the top are several fantastical towers. I think the painter was aware of Pisanello's Verona fresco (ca. 1436-38) with the towers of Trebizond in the upper register. He was probably also aware that Bessarion came from Trebizond, and that Regiomontanus had just been working on a Ptolomy manuscript from Trebizond. And for information about one of my favorite novels, The Towers of Trebizond, go here. galloping on the hillside of Mistra would have been inadvisable. If you recall the interior of Ag. 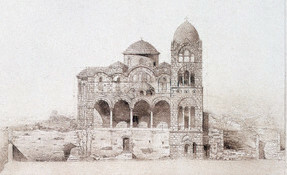 Demetrios, the little Mistra cathedral, you may remember that some of the frescos have been sliced off for the addition of galleries above. This has been explained, and by people who should know better, as having been done for Constantine's coronation. For one thing, look at the timing. John died on October 31. It was nearly a month before the emissaries from Constantinople could get a boat for the Morea. Constantine was made emperor on January 6, the Feast of the Epiphany. When was anyone going to have time to slice off the top of Ag. Demetrios, build up new walls, and put on a new roof? An inscription in Ag. Demetrios attributes the rebuilding to Matthaios, Metropolitan of Lakedaimon. He is known to have been Metropolitan in 1427-29, and Methodios was Metorpolitan as 1439. That timing is fairly suggestive, too, but it has not stopped people who should know better from claiming that Matthaios crowned Constantine. We have clear contemporary statements that Constantine was never crowned. 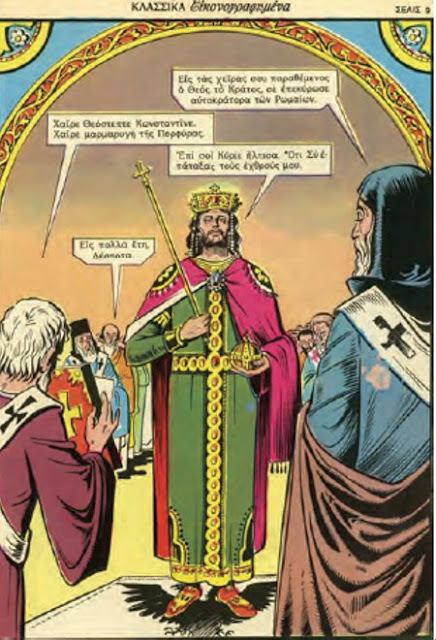 Papamastorakis lists Doukas, Ioannis Eugenikos, Ioannis Dokeianos (all three men who would have known him personally), and the Short Chronicles as specifically saying so, calling him ἀστεφῆ (without a crown) and ἄστεπτο (uncrowned). One Short Chronicle (and Pseudo-Sphrantzes) do say he was crowned, and this is the preferred version, used in Runciman (much cited because he wrote in English), Zakythinos, and Classic Comics. 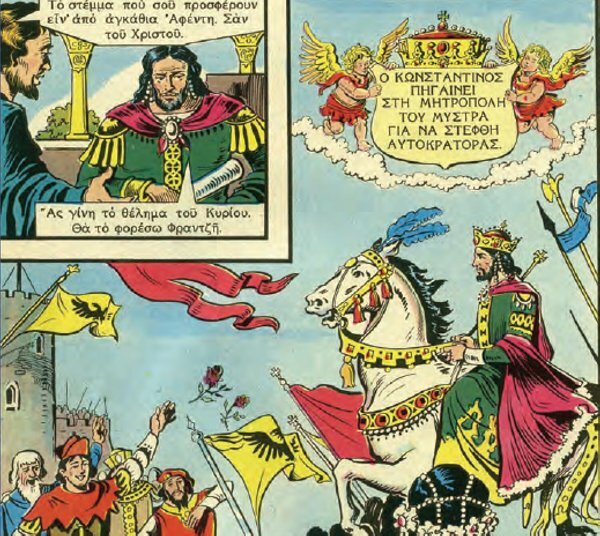 There is something uncomfortable about the preference for the Classic Comics version of history and a non-existent crowning -- this is the nationalistic version, the chauvinistic version of Mistra as the sophisticated. It is perhaps psychological compensation for the enthusiasm with which Constantine's death in 1453 is lamented. put into that position in the 19th century. Tito Papamastorakis, "Myzithras of the Byzantines / Mistra to Byzantinists,"
in T. Kiousopoulou Οἱ Βυζαντίνες Πόλεις (8ος-15ος Αιωνας). Rethymon 2012: 277- 296. I am glad to make a copy of this available if needed. ἐπὶ βασιλείας τῶν εὐσεβεστάτων / βασιλειῶν ἡμῶν κῦρ Θεοδώρου Παλαιολόγου τοῦ πορφυρογενήτου / κατα μηνα σεπτεμβριους του 6937 ‒ "in the reign of our most devout rulers, Lord Theodoros Palaiologos in September 1428." To mention "our rulers" and then give only one name suggested that Fourmont had copied carelessly. But this inscription has been the foundation of the conviction that the Pantanassa can be dated to 1428. A recent article by the wonderful art historian, Tito Papamastorakis (citation below) addresses problems of this inscription, as well as a number of other Mistra issues, and I am lifting from him for this entry. It was already known that Neilos and Dionysos did not co-exist in the same year, as an inscription from Gortynia has a Matthaios as Metropolitan in 1427-28. Papamastorakis translates εὐσεβεστάτων βασιλειων as "pious emperors" and believes John VIII and Maria of Trebizond should be named, as well as Theodoros and Cleofe. But various contemporary writings from Mistra refer to the Despot as βασιλειος and his wife as βασιλισσα, so I don't worry about John and Maria. Papamastorakis went hunting in the Mistra museum storerooms and found a slab of marble with an early Christian cross on one side, and on the surviving border the part of the inscription that mentions Lord Neilos. Papamastorakis finds that the mixing of Σ with C for sigma, and also the Ω indicate a late date for the inscription, after the 16th century and before 1730. This altar inscription is, then, a fake, and the date of 1428 is quite useless for dating either the founding of the Pantanassa or its paintings. Still, I wonder -- were there so many travellers in the 17th century that it was thought worthwhile to forge an altar? Might the monks have been trying to recreate an altar they thought they knew something about? Or was the creation of the altar intended to support the Pantanassa's side in an argument between monasteries over authority? 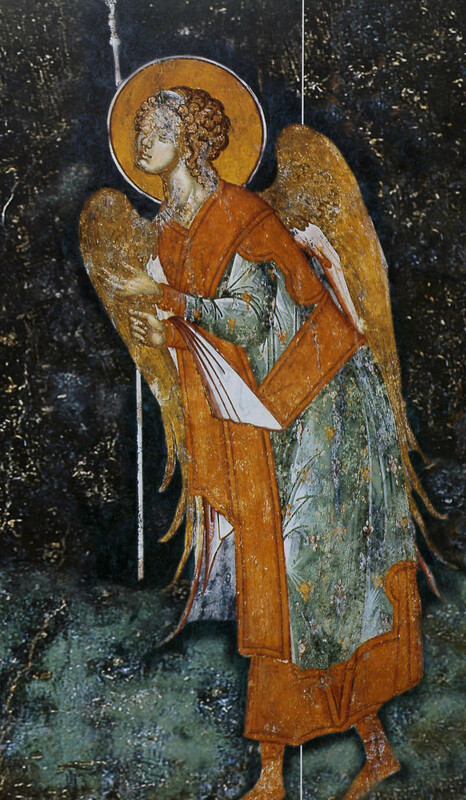 Nevertheless, the Pantanassa angel above is a small miracle. Tito Papamastorakis, "Myzithras of the Byzantines / Mistra to Byzantinists," in T. Kiousopoulou> Οἱ Βυζαντίνες Πόλεις (8ος-15ος Αιωνας). Rethymon 2012: 277- 296. I am glad to make a copy of this available if needed.